I think most of us parents owned a kitchen set, or played with one at school while we were growing up. While those cheaper, less realistic plastic kitchen sets can be a lot of fun – if you are looking for an incredibly durable, incredibly fun kitchen set, you should look at KidKraft Kitchen Sets. Below is our list of our favorite KidKraft Kitchen sets, and hopefully you will have as much fun with yours as our child has had with ours! 1.) KidKraft Uptown Espresso Kitchen – I am a huge fan of the KidKraft Uptown Espresso Kitchen set, and this is the most highly rated kitchen set from KidKraft on most shopping websites. I really like the color scheme and modern look it has. It is 42.5 x 17.1 x 41 inches, which is large enough for multiple children to play with it at the same time. It has a large rectangular sink that can be removed relatively easy, it has four oven burners with multiple knobs, as well as a freezer, refrigerator, microwave, oven, and dishwasher. It even has a towel rack on the side. All the knobs twist and turn and make fun noises. The countertop has a unique design to it, and all the little details have been planned out with this set. There is a chalkboard on the freezer, little hanging pegs on the backdrop, storage space above the sink, and even a cordless phone space. The set is very heavy, probably right around 70 pounds. It does come with an anchor set to attach to the wall to prevent accidental falling. The manufacturer age recommendation is 36 months to 15 years. Play food does not come with it, so that will need to be bought separately and plan on 3 hours or more for assembly time. The big selling points with this kitchen set is its unique design, large size, great functionality, and attention to detail. 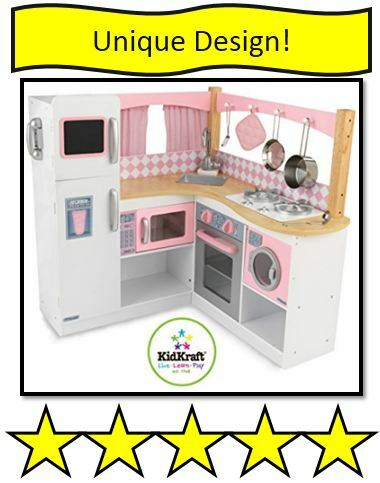 Also, with a price right around $150 – there is a reason this is our number 1 KidKraft Kitchen Set recommendation. 2.) 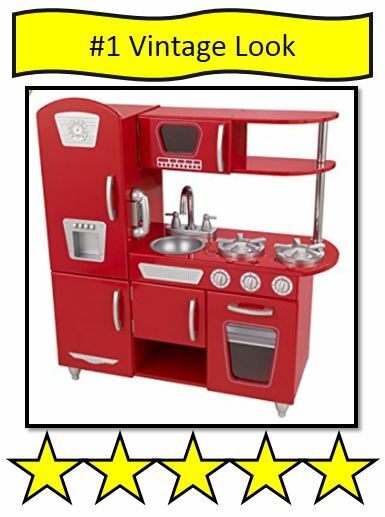 KidKraft Vintage Kitchen – The Kitchen set that we picked out for our sons was the Red KidKraft Vintage Kitchen. We have absolutely loved it, and it has held up pretty well even with two young boys beating it up over the years! We choose the vintage style because of its unique and classic look. It comes in different color options, including white, navy, pink, red, and light blue. No matter what option you pick, it will be 33 x 13 x 35 inches in size. It is large enough for two children to play with. It has a microwave, refrigerator, freezer, storage cabinet, and oven that has doors that open and close. It also has an easy to use/remove sink space and two large oven burners. There are racks in both the refrigerator and oven that can be removed. There is little piece underneath the microwave that you can rotate to spin the plate inside the microwave that my kids seem to love to play with. The oven knobs click and turn, and it also comes with a cordless phone (which I was amazed my kids knew what it was since we don’t have anything but cellphones in our house). It weighs about 50 pounds, and we do recommend using the anchor kit because we did have one push over when we didn’t have it attached. The price will vary based on the color scheme, which will be between $100 to $160 – the slick looking Navy Blue version is normally the most expensive. This is a great buy for anyone looking for that nice vintage looking kitchen set for their kids! 3.) KidKraft Large Kitchen- The KidKraft Large Kitchen is a great choice for parents that are looking for…well…a large kitchen play set. 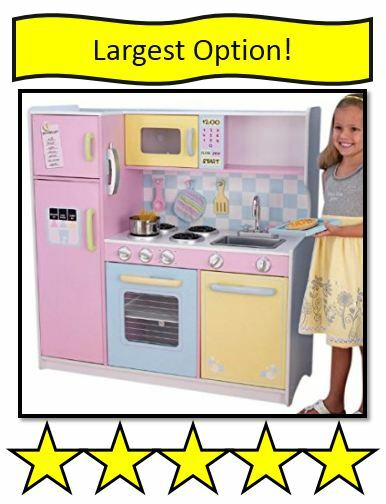 This large kitchen playset weighs about 88 pounds – and is 42.2 x 16.2 x 42.9 inches in size. This will provide plenty of space for children to play in. There is a refrigerator, freezer, oven, microwave, and dishwasher – all of which can be opened and closed. The oven and microwave have a see thru door, and there are plenty of knobs that can be twisted and turned. It does have some pegs that you can hang kitchenware from, as well as four different burners to do your pretend cooking on. The sink can be removed for easy cleaning – which is nice the more this kitchen set gets played with. It is recommended for children ages 3 and up – and parents – you are going to have to invest multiple hours of assembly time into it due to its large size. It does have more of a pastel color scheme to it, most people would say it is a color scheme traditionally marketed to girls. The big buying point for this playset is the large size, if you are looking for something that multiple children can play with at the same time, this is a great pick for you! 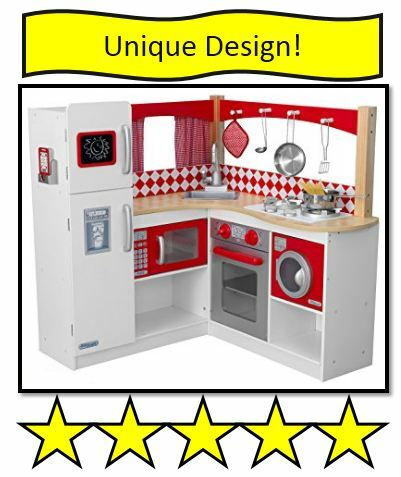 4A) KidKraft Grand Gourmet Corner Kitchen – Like the name implies, this uniquely designed Kitchen Set is “L” shaped to fit squarely into a corner for storage if needed, and can be pulled out at any time to play with. The shape also gives it a very firm base – so you won’t have to worry too much about it being tipped over. The kitchen itself has an oven, microwave, refrigerator, and freezer – all with doors that will open and close. It also has a phone, and plenty of knobs you can twist and turn throughout the kitchen. Unique features include a washing machine, and behind the sink, this version even has some curtains that open and close. It also comes with a metal pot, metal pan, and two metal spatulas – most other sets do not come with any food equipment. It is under 40 inches in height, so it is a little smaller than some of the other options. 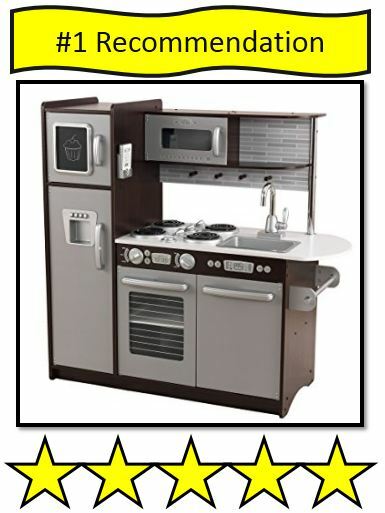 Your big buying points for this kitchen set is the unique shape, and some of the extra features that this kitchen set has that others do not! 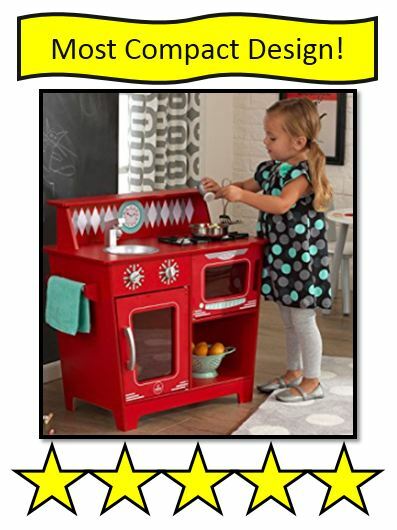 4B) KidKraft Wooden Red Corner Kitchen – This is a newer, more updated, version of the KidKraft Grand Gourmet Corner Kitchen listed above. The height and weight for both of these models is the same, and so is the “L” Shape design and basic layout of everything. You even get the same spatulas, pan, and pot as the before mentioned version. So what are the differences? It is the color scheme. This version has done a nice job of incorporating more color, and it really makes it very catchy to the eye. The Microwave, oven handles and knobs, and laundry area are all red. It also has a white and red diamond shaped backsplash above the counters. Other red accents include the phone and chalk board on the freezer – plus some of the wood frame is red as well. The big reason to buy this version over the Gourmet Corner Kitchen option is the color scheme. If you are like me and really like those red accent pieces – you will want to buy this option. 6.) KidKraft Uptown Natural Kitchen – If you are looking for a rustic, natural looking kitchen set, check out this KidKraft Uptown Natural Kitchen. It is 43 x 17.8 x 41 inches in size, and weighs about 72 pounds. That should provide plenty of space for multiple children to play on. It is almost identical to our number one option – the Uptown Espresso Kitchen – except for the color scheme (both have a freezer, fridge, oven, dishwasher, microwave, sink, multiple burners, pegs to hang kitchen supplies, and so on). This option has a more natural, light wood color to it, compared to the very dark, eye catching Espresso color scheme that made the Uptown Espresso Kitchen our number one choice. If you are more into that natural wood look – this is a great pick for you, especially if it matches the home décor look you have going for you! 7.) KidKraft Ultimate Corner Play Kitchen Set – The unique design of the KidKraft Ultimate Corner Kitchen makes it a great choice, and it will provide plenty of play space for multiple children (size is 33 x 42 x 36.5 inches and the weight is about 60 pounds). What is neat about this design is you have your refrigerator, freezer, and oven on the right hand side, the middle is made up of a storage space, sink, and microwave, and the right segment consists of a washing machine and counter space. The corner design helps provide a very stable base, and should allow you to not need the wall mounting set like some of the other sets need. It has all the little features you would expect as well, such as knobs that twist, doors that open, handles that turn, a cordless phone, and so on. You also have two color schemes to pick from. A very traditional white color scheme with some grey pieces splashed into it for some extra color. You can also pick from a darker brown color scheme, which is the one I prefer since it has a slightly more modern look in my eyes. It is recommended for children ages 36 months and up and it normally costs right around $200. The big buying points are the size and corner design. 8.) KidKraft Deluxe Big & Bright Kitchen – If you are looking for a kitchen set for younger children that is loaded with fun and bright colors, the KidKraft Deluxe Big & Bright Kitchen should be the one that you pick. 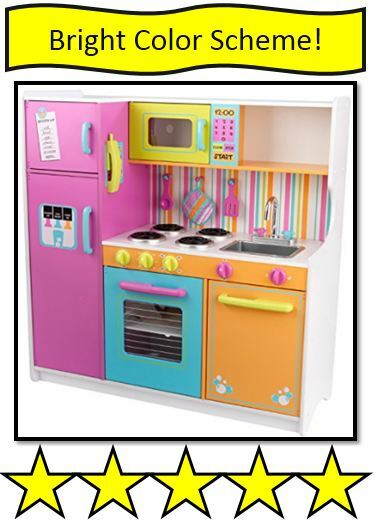 This set has the things you expect out of a KidKraft kitchen – such as a freezer, refrigerator, oven, microwave, burners, knobs, a removable sink – and this version even has a storage area underneath and above the sink to store all of the pots, pans, and kitchen utensils that you purchase for it. 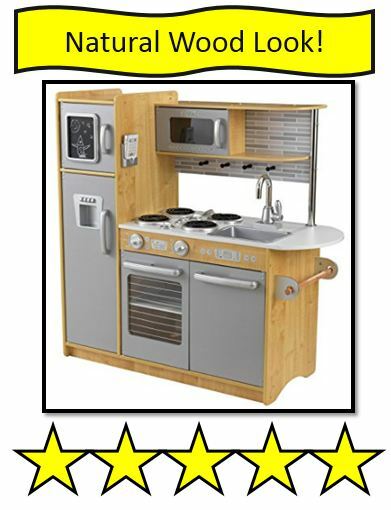 This kitchen set is 42.25 x 17.25 x 43 inches in size (plenty of space for two children), and the durable wood pieces that it is made from help get the weight up to nearly 80 pounds. Why you would choose this kitchen over some of the other options is the fun color scheme. It has splashes of orange, yellow, blue, and purple – really all of those bright colors that kids really enjoy. So if you are looking for an eye catching piece for a child’s playroom, this is a great pick for you. 9.) KidKraft Kids Kitchen Playset – Not everyone has the space, or wants to have, one of those full sized kitchen sets. For younger toddlers, or just to save space in a playroom, the KidKraft Kids Kitchen Playset is a good choice. This play set is about 25 pounds in weight, and is 30.5 x 16.5 x 4.7 inches in size. This makes it easier to store, and easier for young children to play with, but it does become almost too small for 4, 5, 6 year olds to play with comfortably. There are a few design options, but they have a very classic look, and I’m a big fan of the red. It is not full size, so it is very compact. It has a sink, burners, oven, and refrigerator + a small storage space. It may be compact, but there is plenty of fun things for your child to play with. These kitchen sets should cost right around $75, so they are some of the most affordable options from KidKraft you can buy. It also can be assembled in less than an hour – that is much quicker than those full sized options! 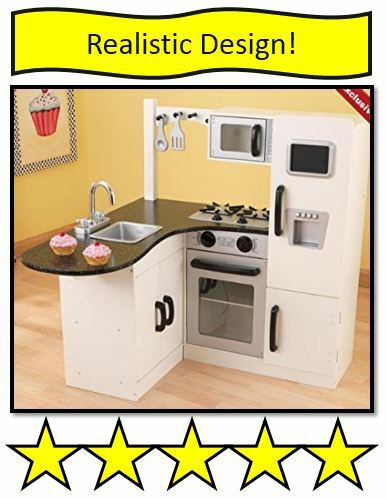 Buy this choice if you want a kitchen set for very young children or need to preserve space! 10.) 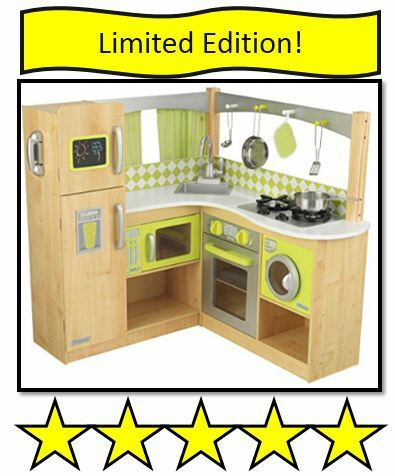 KidKraft Wooden Lime Green Corner Kitchen (Limited Edition) – This is a great kitchen set for parents that are looking for something a little different. It has a classic light wood design and look that is supplemented with some bright lime green splashes of color. It is a corner kitchen design, and will have a freezer, fridge, microwave, oven, sink, burners, washing machine, hanging pegs, and a couple of spots for storage. This is the same basic layout that most of the other corner kitchens use, it’s just the color scheme and look that is different. It does come with 4 metal accessories which includes a pot, pan, ladle, and spatulas. The size will make it easy for multiple children to play with, and this should be a great edition to any toy room – especially if it has a wood or bright color scheme look going for it. 11.) KidKraft Chef’s Corner Play Kitchen – This may be the most realistic of all the KidKraft Play Kitchen Sets because of how the counter is designed. It really will remind adults of a useable kitchen space with a sink and counters to prepare food on before taking it over to the oven for cooking! Besides the great countertop design, it has a classic black and white color scheme that is a lot of fun. It comes with a fridge, freezer, oven, burners, microwave, sink, and storage area under the sink. Of course there are a few knobs and doors that open as well. The mixing spoon and spatula are included as well. The size is great at 36.5 x 34 x 34.75 inches in size. It does weigh about 65 pounds, and is built very well and shouldn’t have any problem standing up to heavy usage from kids! 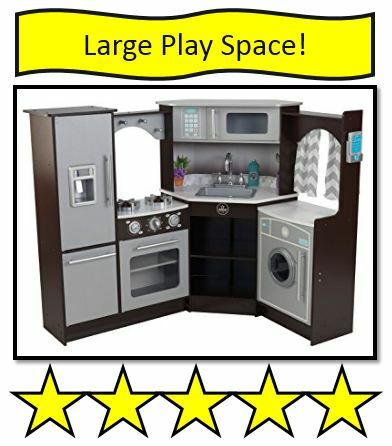 This version has not been available for nearly as long as most of these other KidKraft Kitchen Sets, so there is a lot less reviews on this one than other choices, but the limited user experiences being shared online are overwhelmingly positive! All of these Kitchen Sets will make a great addition to your home and should make you really happy! If you are looking for some other great toy ideas from KidKraft, check out this article on the best KidKraft Train Tables and our personal review of the KidKraft Grand Central Station Train Set!